During our first 25 years, ELECTRO PJP have developed a range of accessories which have enabled partnerships with well-known Test and Measurement equipment manufacturers as well as giving us the opportunity to service a growing network of International Specialist Electrical Distribution outlets. 1979 - ELECTRO PJP opens as a manufacturer of Test and Measurement accessories. 2005 - ELECTRO PJP joins the NOVARC group. 2008 – ELECTRO PJP develops a range of accessories dedicated to the Electrical Installation and Testing marketplace. Products included – Cable Reels, Telescopic Probes and Earth Ground Rods. Our customers include Control bodies and General Electricians. 2010 – ELECTRO PJP begins to develop a range of Electrical Installation Test equipment. The Wheel- and Tohm-e combine innovation and function to create a unique offering. Based in TAVAUX (39), FRANCE, ELECTRO PJP are well resourced with 50 Staff covering; Design and Engineering, Sales, Testing and Certification, Quality Control, Production, Purchasing and Finance operating form this site. At ELECTRO PJP, we pride ourselves on designing, manufacturing and delivering high-quality products which keep us ahead of the ever-present competition. To maintain this approach, the in-house ELECTRO PJP Quality Assurance Team constantly monitor all aspects of the manufacturing process, giving our customers peace-of-mind when purchasing or using the ELECTRO PJP brand. At ELECTRO PJP the customer is our main focus. We understand your needs and are able to customize product to suit your application. We hold large stock of finished product. We react quickly to your requirement. 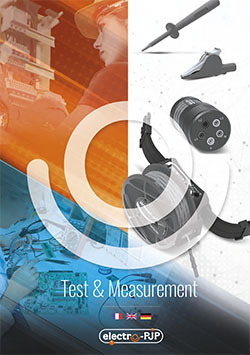 ELECTRO PJP is the ONLY Test and Measurement Accessory Partner you need!